International Journal of Research in Health Sciences,2014,2,1,254-262. 1-Senior Resident, AIIMS Jodhpur, Rajasthan. 2-Professor & HOD, Dr.S.N.Medical College Jodhpur. 3- Assistant, Professor, Dr.S.N.Medical College Jodhpur. 4-Senior Resident, AIIMS Jodhpur, Rajasthan. 5-Junior Resident, AIIMS Jodhpur, Rajasthan, Department of Community Medicine and Family Medicine, Rajasthan, INDIA. Background: Cancer is most fearful disease and more than two-thirds of cancer patients are in advanced and incurable stage at the time of diagnosis. Public awareness about cancer can play a big role in prevention and early detection of cancer. Objective: To study the self-reported knowledge, attitude, and preventive practices on cancer among urban dwellers of Jodhpur, Rajasthan. Materials and Methods: A total of 880 men and women of 20 years and above, were interviewed using a pretested open questionnaire after having their consent. They were selected by systematic random sampling. Results: The study population consisted of 398 males and 342 females. 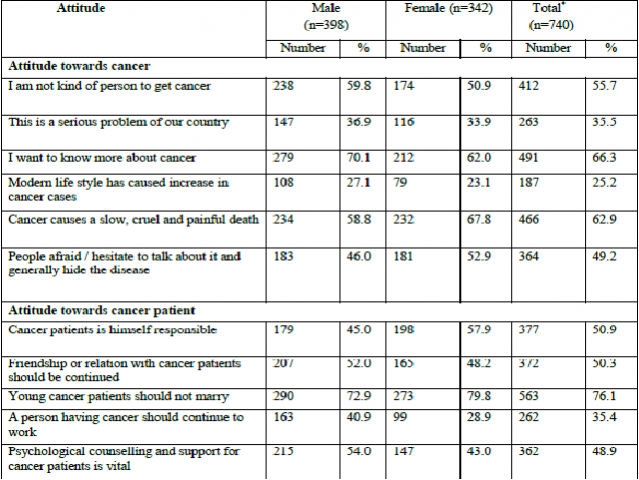 More than 50% of respondents knew about the tobacco and alcohol as a risk factor for cancer with poor knowledge regarding other risk factors of cancer. Respondents were not much aware of common warning signs and symptoms of cancer, which are most important for early diagnosis and treatment. The major source of information related to cancers was T.V. (63.1%) followed by friends / relatives (58.3%).37.3% respondents think that cancer is never curable and 55.8% think it is preventable. Only 4.6%, 1.5%, 2.2% and 3.5% of study participants were aware about Breast self examination, Mammography, Pap smear test and Oral visual examination respectively. Conclusions: Knowledge about risk factors, warning signals and particularly screening of cancer was very poor and more so in lower educational and socioeconomic strata of the community.